Fractions are difficult to grasp. 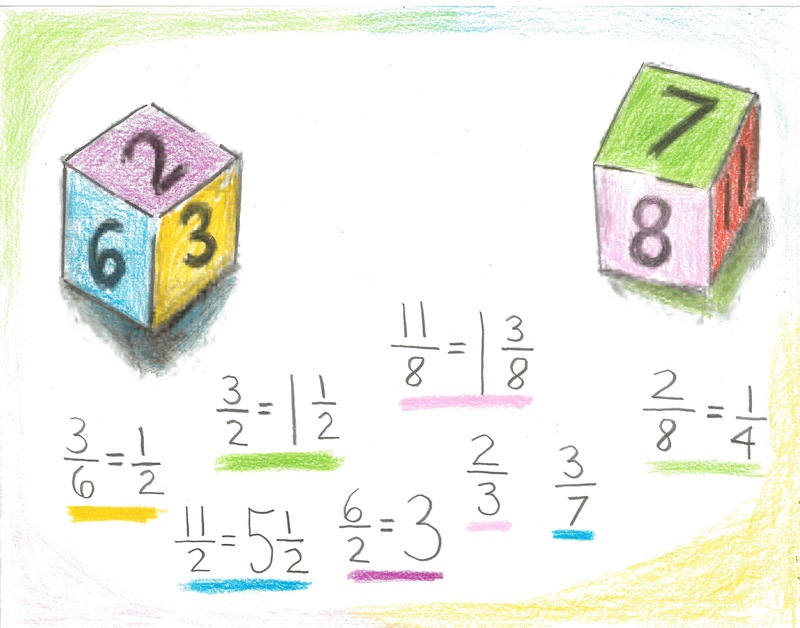 They, like many other math concepts, are best taught concretely and colorfully. You can introduce fractions simply and graphically by cutting up a piece of fruit. It’s easy to see that a whole apple represents the number one, cutting it in two is plainly halves, in four is quarters, and so on. You can use this image again later, when teaching the four processes with fractions. Many visuals can be used to teach fractions. Coins and cubes are just two of them. Using coins to teach fractions and decimals works well because $1.00 represents 100 and so translates quite literally to decimals. Decimals can then be converted to fractions by placing the coin amount or decimal number over 100 and reducing the fraction. Try this! Toss a number of mixed coins onto a desk or tabletop, then place a piece of paper over them. Tape the corners and have your child(ren) carefully make rubbings of the coins with a pencil or crayon. 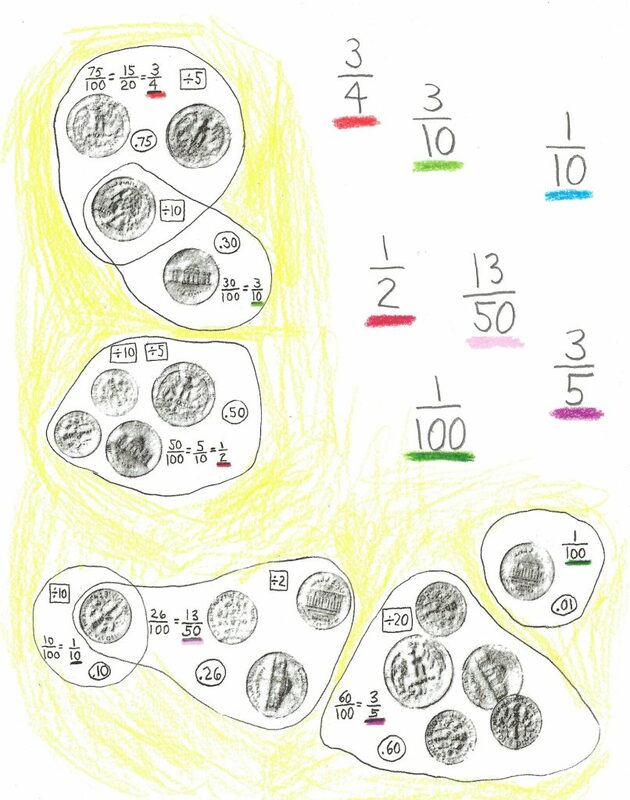 Remove the paper, and circle groupings of coins as shown, writing the amount with a decimal and placing a small circle around it. Write that amount over 100, then with guidance have the children reduce the fraction in one, two or more steps. Note which number is used to reduce the fraction, place a division sign in front of it and a box around it. Underline the final fraction, and have the child(ren) add color at the end, writing each of the fractions that were found. Cubes can be a fun tool to use for fractions and mixed numbers practice. You can find plain wood cubes in different sizes at any crafts store. Have your child(ren) number them on each of the 6 sides: 1-2-3-4-5-6 on one cube and 7-8-9-10-11-12 on the other. You may want to add additional cubes later, but just 2 should be fine to start with. Try this! Note the many combinations, and that the numbers can be stacked differently. It’s an excellent way to teach proper and improper fractions and changing improper fractions to mixed numbers. You can have the child(ren) write the fractions and mixed numbers on paper or in a workbook, writing them out in words as well. For example, 11/2 = 5 1/2, eleven halves = five and one half. Have fun with fractions!